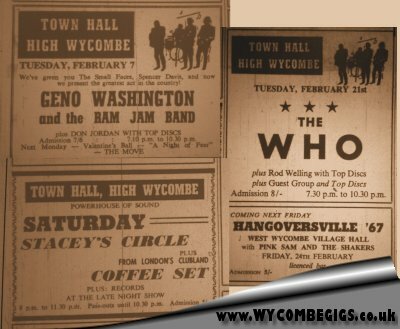 February 1967 saw the gig scene in High Wycombe continue with a string of dates at The Town Hall, plus what appears to be a new venture held at the Royal British Legion building close to the Town centre. These are brief details of gigs that I have traced and backed up by advertising evidence found in the Bucks Free Press. If you have any further details of these gigs or can add more dates, please get in touch. Geno Washington and The Ram Jam Band took to the stage of High Wycombe Town on Tuesday 7th February 1967 for a gig billed in the Bucks Free Press advert by the strapline: “We’ve given you The Small Faces, Spencer Davis and now we present the greatest act in the country!” At the time of this performance Geno Washington was aged 23 years old, having starting performing with The Ram Jam band in 1965. Washington was a former US airman based in East Anglia. Admission was 7 shillings and 6 pence (37 ½ p) with DJ Don Jordan playing ‘Top Discs’. See separate post on this unconfirmed performance by the famous Welshman. See separate post on this performance. The Stereo was a club night held at The Royal British Legion building opposite Wycombe College. The Ginger Tom Set were described in the gig advert as ‘A Strange name but a really good group well worth seeing’. Admission was 4 shillings and 6 pence (22 ½ p). At the time of this post I’d found no further background on this band. Billed as a ‘POWERHOUSE OF SOUND’, 5 shillings (25p) would have gained you entry to this Saturday night gig featuring Stacey’s Circle supported by Coffee Set (from London’s Clubland). My brief research suggests that Stacey’s Circle were a band from the Ilford area of London and consisted of George Stacey Taylor (vocals), John Campling (guitar), Dave Hawkins (bass) and Frank Edwards (drums). Guitarist John ‘Ducksy’ Reardon also states he was in an earlier version Stacey’s Circle through his autobiography ‘Birth to Reunion’ published in 2015. The Who would eventually perform at The Town 25th April 1967. DJ Rod Welling replaced Don Jordan, who had left High Wycombe for Nottingham. An article published in the Bucks Free Press during the Spring of 1967 explained the history behind Welling’s arrival on the DJ scene. Welling claimed that his first public performance with pop music was when neighbours called in the police because of the ‘racket’ from his record player. The then 20 year old hoped that the Tuesday evening DJ slot at the Town Hall would be the beginning of a ‘career on the pop world’. This gig was billed as ‘HANGOVERSVILLE ‘67’ in the small advert carried in the Bucks Free Press. 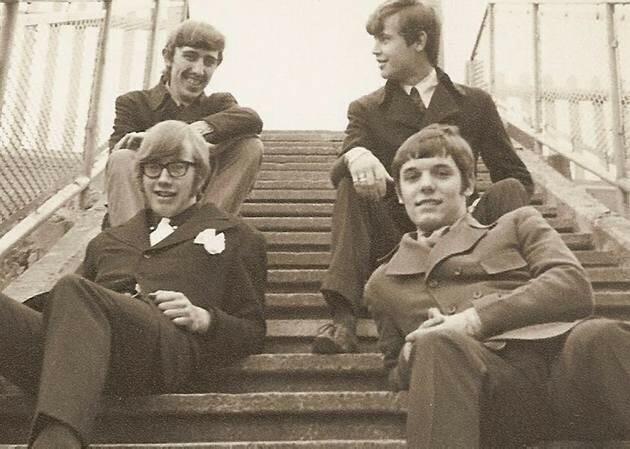 A quick search on the internet at the time this article was published, reveals that well know High Wycombe musician Steve Darrington was a piano player with Pink Sam and The Shakers. Admission was 5 shillings (25p). Stacey’s Circle – Where are they now? The Widdess.co.uk site was a pilot before I registered PinkSam.com. I’ve now revised the link in the original post. I will see if I can find any other Pink Sam and The Shakers adverts from the local press. No part of this website or the articles published here may be reproduced or transmitted in any form or by any means, without prior permission from the author. Contributions are most welcome but please post responsibly. Initial posts will be moderated while I determine that you are a human.